However, digital workflows must be executed properly, and this starts with the successful digitization of glass slides by means of whole slide scanning. Get this part right, and it will positively benefit the rest of the pathology workflow. 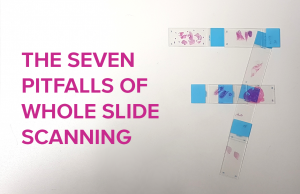 Let’s look at the seven most prominent pitfalls encountered in whole slide scanning and the potential solutions for overcoming them – click to download the Seven Pitfalls of Whole Slide Scanning.